measuring 23.6 inches tall. The previous record-holder, Nepal's Khagendra Thapar Magar, is 26.3 inches tall and held the title for about eight months. Although the shortest living man, Balawing missed the title of shortest man in history, which is held by Gul Mohammed of India, who was 22.5 inches tall and died in 1997. Weighing in at only 11 pounds, Balawing looks like a toddler, and has experienced health and speech problems due to his size. Balawing's size has not always been cause for celebration: his family said that he was born as a normal sized baby, but quickly became sickly before his first birthday. He completely stopped growing two months after his birth and was not able to walk until he was five-years old. Around this time, Balawing was removed from school because he had proven distracting to the other students.His father Reynaldo Balawing called his son a “lucky charm,” because, after his birth, Reynaldo was able to find a job that could support their family. Although the Guinness world record does not come with a cash prize, Glenday said he hopes that Balawing's new fame will help in soliciting donations for medical supplies.Junrey Balawing is only 17 years old but he looks like a baby. When he turns 18 in June he will officially be the world's smallest man according to the Guinness World Records. 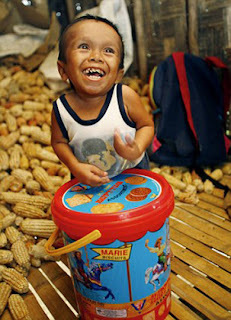 Junrey is 22 in (52 cm) tall and he can't walk and stand for too long because of pain.